Maggie and Jason aren’t the type to do a wedding the fussy way. 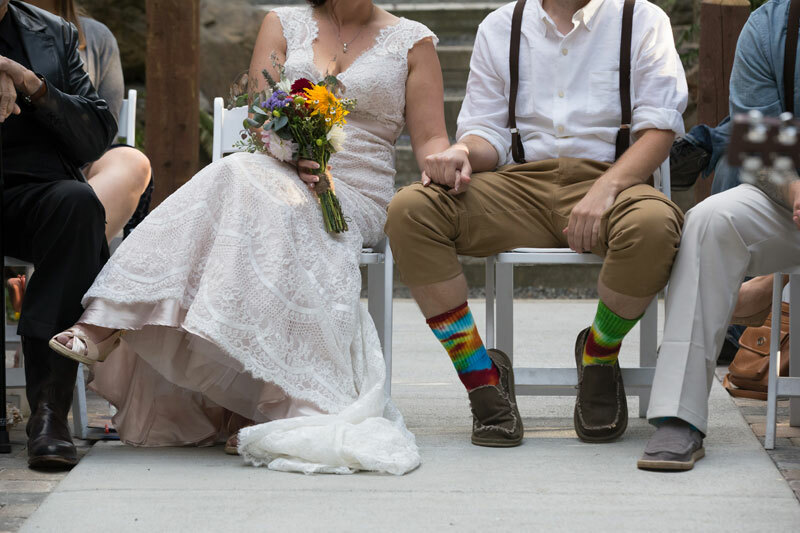 They’re more the DIY Tie-Dyed flower girl dresses and groomsmen’s socks type. The ceremony in the round type. The taco truck type. And their wedding was awesome. The afternoon started out with some portrait fun, and then the entire crowd of guests and bridal party gathered on the lawn to make a big processional train through the woods to the ceremony round, all while the bride’s brother and the groom’s father’s bluegrass band accompanied them on the walk. Maggie’s mom read a poem and her brother sang a song, each guest took a sincere moment to warm the rings as they were passed around, and everything was topped off by the blowing of a conch shell as a nod to the family’s time spent on the islands. After the ceremony, it was time for a chill reception filled with taco truck food, mini cupcakes, booze, dancing, and the finishing touch: a glowstick dance. It was a great party, and we were so glad to be a part of it.